The U.S. government is discussing with the new authorities in Yerevan the possibility of providing more economic assistance to Armenia under a special program designed to foster reforms in developing nations, U.S. 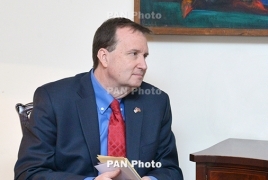 Ambassador Richard M. Mills said on Thursday, May 31, RFE/RL Armenian Service reports. “We are very pleased to be fully engaged with the new government and have an opportunity to talk about how the U.S. government can help the new government,” Mills told reporters. Armenia qualified for the Millennium Challenge Account (MCA) program shortly after Washington launched it in 2006, receiving $177 million for the rehabilitation of rural irrigation networks. The Millennium Challenge Corporation (MCC), a U.S. government agency running the aid scheme, also planned to allocate $60 million for the reconstruction of the country’s rural roads. But it scrapped that allocation shortly after a disputed 2008 presidential election that was followed by a harsh government crackdown on the Armenian opposition. The administration of former President Serzh Sargsyan tried unsuccessfully to restore Yerevan’s eligibility for the multimillion-dollar scheme in the following years. U.S. officials said, among other things, that it is not doing enough to combat widespread corruption. The United States signaled its readiness to boost economic aid to Armenia following the recent democratic revolution there. Visiting Yerevan earlier this week, a U.S. deputy assistant secretary of state, Bridget Brink, offered U.S. assistance to the new Armenian government’s ambitious anti-corruption agenda. Mills said Brink discussed with Prime Minister Nikol Pashinyan and other senior Armenian officials “possible options” for increasing U.S. aid. Those include renewed MCA funding, he said. “We will continue those discussions,” added the U.S. ambassador.